Just in time for the convertible season, Fiat has unveiled a new special edition of the 124 Spider called the Urbana Edition with dark exterior and interior accents that create a sporty appearance. This is the fourth Fiat model to receive the Urbana Edition package, meaning it’s now available across the entire Fiat range. 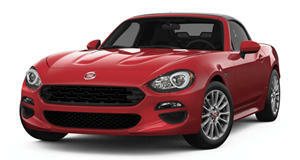 The Fiat 124 Spider Urbana Edition will debut next week at the 2019 New York Auto Show. This is becoming a tradition as the Fiat 500 Urbana Edition was unveiled at last year's New York Auto Show.